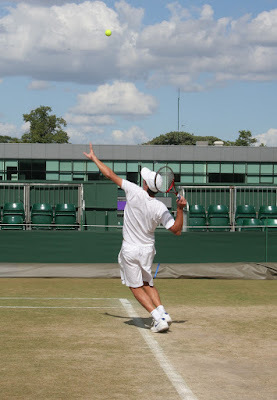 A few summers ago while doing research in Cambridge I had the opportunity to visit The All England Lawn Tennis and Croquet Club during the Wimbledon Finals. Furthermore, I was able to cross this off my bucket list of sports without breaking the bank. Few people realize that tickets for the event can be obtained by standing in "The Queue". While you generally have to arrive very early to score tickets to the center court, you can easily obtain general admissions tickets for only 8 pounds for the championship day. The year I went, I got to see Rodger Federer beat Andy Roddick in 5 sets in the longest men's final (in terms of number of games played) in Grand Slam history. After the match I saw Federer in person with the trophy which was an amazing experience. General admission gets you into the grounds, and although you wont actually be able to see the center court action in person, there is still more than enough to keep your senses tingling. On the day of the championship match there were several other smaller matches on side courts. One of the more intriguing was the men's doubles wheelchair finals. There is a festive atmosphere throughout and a large screen broadcasting the action inside the center court. Many people just plop themselves down in the grass and make themselves at home. If you go, make sure you pick up a Pimms Cup and strawberries and cream.